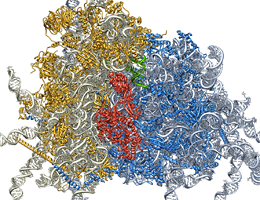 An LMU team has revealed the architecture of the ribosomes in human cells for the first time. The results highlight that the protein factories of higher eukaryotes are more complex than their counterparts in unicellular organisms. Ribosomes are large molecular machines which form assembly lines to produce all of the cell’s proteins by linking thousands of building blocks together in accordance with the genetic blueprint. Ribosomes comprise 50-80 different proteins and several RNA molecules. The structure of the bacterial ribosome was elucidated about 10 years ago, which was later rewarded with the Nobel Prize for Chemistry. Recently, researchers have used X-ray crystallographic methods to also determine the architecture of the ribosome from unicellular eukaryotes, such as brewer’s yeast. “The greater complexity of ribosomal architecture in higher eukaryotes has so far prevented detailed analysis of their structure ” says Professor Roland Beckmann of LMU’s Gene Center. But Beckmann’s group has now employed cryo-electron microscopy to pierce the fog. By analyzing thousands of images of single, randomly oriented ribosomal particles, Beckmann and his team have succeeded in reconstructing the three-dimensional structure of ribosomes from two different multicellular eukaryotes, the fruitfly Drosophila and Homo sapiens. A comparison of the newly defined structures with those of simpler ribosomes affords detailed insights into the evolution of these amazing molecular machines, and uncovers interesting differences. “The ribosomes of higher eukaryotes, in particular those of humans, have an extra layer made up of very long tentacles of RNA. These are probably important for mediating interactions between the ribosome and the richer microenvironments found in the multiple cell types of higher organisms,” Beckmann suggests. These new insights into ribosomal structure will certainly lead to a better functional understanding of this intricate cellular machine. “With this work, we have laid the foundation for further biochemical, molecular biological and mechanistic studies of protein biosynthesis in humans,” Beckmann asserts.